BASKETBALL SPOTLIGHT NEWS: Basketball Spotlight Tip Off Classic 8th Grade White Division Championship Recap: Playaz Make Statement! 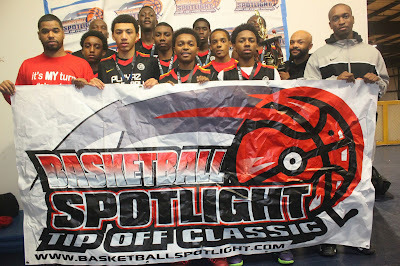 Basketball Spotlight Tip Off Classic 8th Grade White Division Championship Recap: Playaz Make Statement! The Playaz Basketball faced the toughest competition possible and ran the table to win the Basketball Spotlight Tip Off Classic 8th Grade White Division Championship. They defeated rival Team IZOD 59-42 to take home the trophy. The victory removed any doubt that the Playaz now represent the top 8th Grade team in the region.